MK Themed Attractions has transformed the old Sherwood Forest at Walibi Holland into a mysterious wilderness forest for the new hybrid coaster Untamed. The extensive theming at Walibi Holland included a wide-ranging fibreglass production, which MK Themed Attractions is known for, along with its comprehensive woodwork, iron work, painting and decorating skills. 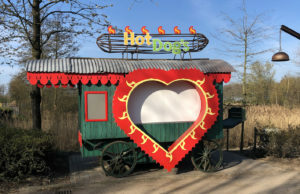 Leisure Expert Group has designed the new area, including the re-theming of a hotdog stall and the pizza house, Merlin’s Pizza where MK Themed Attractions has covered the building with wood and hand painted the pizza image on the building. 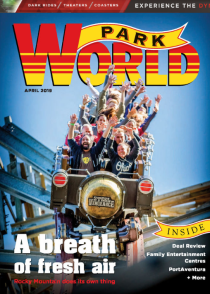 “We have produced many of Leisure Expert Group’s previous designs including Movie Park’s re-theme of their Rapid River and most of Djurs Sommerland’s theming including the brand new Tigeren,” said Rene Hansen, managing director at MK Themed Attractions. 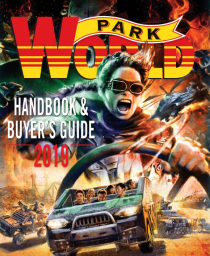 “So we have time and time again proved that we are good at bringing designed visions to life for large-scale projects such as Walibi Holland’s new Wilderness area”. The rapidly growing theming company has also proved its skills in producing large-scale iron constructions such as the brand new giant eye-catching sculpture used as entrance for the Wilderness area. 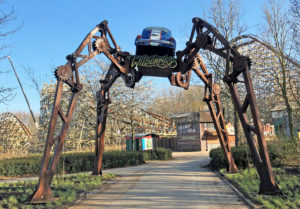 The sculpture is designed with four steel arms, gears and a dark blue Volkswagen on top that visitors will be able to walk under when entering the area.